The carriage is a half of a two compartment size – apparently the Railway Works used to sell them off by the foot! It was built by the Great Central Railway at Gorton, Manchester sometime from1873-1876. The GCR was part-owner of a couple of smaller railways in the area, and this one was built not for themselves but for either the Cheshire Lines Committee or the Manchester South Junction and Altrincham Railway. In 1923 the GCR became part of the LNER and the smaller railways jointly owned by the LNER and LMS . Maintenance and repair of carriages moved away from Gorton to Wolverton. Originally it was a dual class carriage with one side first class and the other third. 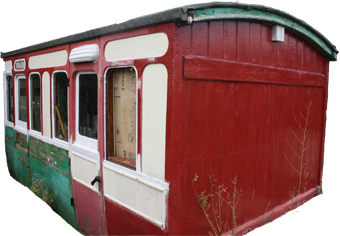 This old railway carriage was very kindly donated to The Community Orchard by Mrs Phyllis Horton. The carriage had been used as a garden shed in Anson Road. NMT Crane Hire of Marston Moretaine kindly gave their services to move the carriage to the Orchard. This carriage is still in use at our Orchard events for serving refreshments. It underwent a long-awaited refurbishment in 2017 which should prolong its life a few more years.